Did you know - Each Brown Bat can consume 600 mosquitoes in an hour? WHY HOUSE BATS: Bats feed on night-flying species of insects such as mosquitoes, corn borers and cutworm moths. While actual number of insects caught varies according to the size of the insects, laboratory studies have shown that a single little brown bat can consume 600 or more mosquitoes in an hour. Bats DO NOT interfere with attracting wild birds. PLACEMENT OF YOUR BAT HOUSE: Most North American bats prefer to live within a few hundred yards of water, especially streams, marshes and lakes. Bats also need an area with an abundance of insects for their food source. The best time to mount your Bat House is in the fall or winter. This allows the wood to age and odors dissipate. 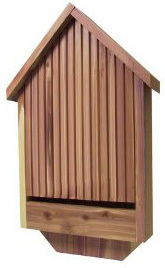 Mount your Bat House on a pole or under the eaves of a house, garage or barn approximately 12-15 feet above the ground facing the South, preferably in an area that receives sunlight during most of the day. MAINTENANCE FREE! Bat houses require no maintenance and should be left in place year round. Do not become discouraged if bats do not immediately occupy your house. It can take up to a year for a bat house to attract a colony.